Viewing a Mockiwi in the enemy log. Particularly: Document what needs to be done to open each creature's entry. Some need to be defeated, and others need to be touched, but there may be more complex mechanics. Also, document every creature's animation when viewing, specifically when you tap on them. Hey! Pikmin has a log feature in which Captain Olimar writes a log about the creatures and treasures he encounters in his journey throughout the game. This feature has no name, being referred to only as "Logs" in the likes of the area selection menu, and is similar to the Piklopedia and Treasure Hoard in Pikmin 2. It also allows the player to view 3D models of each entry, but unlike Pikmin 2, the models appear in a void, and cannot be interacted with other than rotating the camera and triggering a couple of random animations by tapping on them. While viewing an entry, the top screen shows Olimar's log on the subject, while the bottom screen shows the 3D model, as well as a few buttons, detailed here. There are four categories in the logs menu: "Pikmin Log", "Creature Log", "Treasure Log", and "amiibo Log". Although entries are not specifically numbered, each one in a category has its own reserved spot in the list, and if the player has not yet encountered the subject, then a question mark will appear in place of its icon. 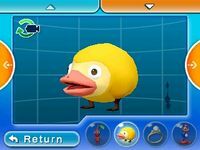 This feature becomes available after completing the tutorial level, although the creature and amiibo categories are initially locked, as explained in their own sections in this article. Viewing a Red Pikmin in the Pikmin Log. 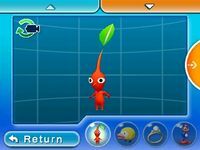 The Pikmin Log contains entry about the different Pikmin types in the game, as well as the Onion and the types of pellet that can be obtained from Secret Spots. This category is represented with the Red Pikmin's icon. The Creature Log documents the enemies found in the journey. This category is initially unavailable, and only becomes available once the player reaches 10,000 Sparklium. The list is roughly sorted by the order in which the enemies are first introduced, and all bosses appear at the end. This category is represented with the Mockiwi's icon. The European name will be provided below the US name with an EU marker if different from the US name. The Treasure Log contains entry about all of the non-amiibo treasures collected. A treasure is only logged after it is recovered and the player reaches the goal in the area it is in. These treasures are sorted by the order in which they appear, following this priority: Sector > Area > HUD icon, and the areas are sorted in the order: A > B > C > D > E > X. The final treasures in this category are the ones that appear on the Pikmin Park. This category is represented with the Loop of Beginnings's icon. The European name will be provided below the US name with an EU marker if different from the US name. The amiibo Log is the same as the Treasure Log, but only contains amiibo statue treasures. Until the player obtains their first amiibo, this category is closed off, and its button shows a question mark instead. This category is represented with the Colossus in Suspenders's icon. The European name will be provided below the US name with an EU marker if different from the US name. The logs can be accessed from the area selection menu, or from the area completion results screen, using the "Logs" button with a data file for an icon, present on the touch screen in either case. When the logs are entered, the game automatically selects the Pikmin Log category. Whilst on a category, the top screen contains the S.S. Dolphin II's pod saying a quick description of the category, while the bottom screen has a grid with the icons of each entry. Undiscovered entries will show a question mark instead. Only 15 entries fit per page, so if there are other pages, a button will appear on the left and/or right side allowing the player to go to the previous or next page, respectively. Dots on the bottom-left, below the grid, represent the current page and how many there are in total. Upon touching an entry's icon, that entry is opened. The top screen then contains Olimar's thoughts about the entry, as well as the name on the top. The bottom screen shows a 3D model of the entry. To the right of the model is the silhouette of a Pikmin, so that the player can compare the model's size to that of a standard Pikmin. This silhouette will not appear when viewing a Pikmin, naturally. The bottom screen also has two buttons at the top, that show the first and second pages of the journal text, in case the current entry's text can't fit in one page. These buttons are disabled if it does fit in a single page. Buttons also appear on the left and right edges allowing the player to quickly see the previous or next entry, respectively, if there are any entries before or after. The player can also drag across the main model viewing area to rotate the camera around. Tapping the camera button on the top-left of this window will reset the camera to the default position, and tapping anywhere on the window itself will make the Pikmin or enemy perform an action, from a small pool of possible actions, that depend on the entry. On any screen of the logs menu, there are four buttons on the very bottom of the touch screen. The "Return" button returns to the area selection menu or area completion results screen. The Red Pikmin icon opens the Pikmin Log category, the Mockiwi icon opens the enemy log category, the Loop of Beginnings icon opens the Treasure Log category, and the Colossus in Suspenders's icon opens the amiibo Log category. When viewing an entry, the only way to return to the category view is through one of the category buttons, since the "Return" button always leaves the logs menu. If there are any unread entries, the "Logs" button on either the area selection screen or area completion results screen will contain a red exclamation mark, and any categories with unread entries as well as the icons of the unread entries themselves will have the word "NEW" on top of them. The logs at the very start of the game. This page was last edited on January 19, 2019, at 11:38.